The Roman Juriga Award (RJA) was established by the European Christian Environmental Network (ECEN) to encourage inspirational innovations of churches on environmental projects across Europe. On 5 September 2011, state and church representatives of Hungary signed an agreement for the collaboration of planting and conserving fruit species that can adapt to regional conditions that have grown in the Carpathian Basin for a long time. The Plant Native Fruit Trees in Church Gardens project was co-founded by Churches and the State, and the Eco-Congregation Movement serves as the operative coordinator for the project in Reformed Church. The aim of the project is to promote the planting of more native trees on church properties in the hopes to increase biodiversity, reduce greenhouse effect, plant native and lasting trees, protect national heritage and conserve and increase natural values, and create a plantation producing oxygen and preserving natural genes. The project was especially innovative in that it strengthens biodiversity, creatively using church properties and encourages ecumenical cooperation. Thirteen ecumenical bodies throughout Hungary took part in the project and dedicated themselves to recognize and affirm Christian environmental action. The Center for Plant Diversity (CPD), a Hungarian government institute, provided the saplings and the experts to inspect the land where the trees were to be planted, monitors the gardens, and organizes two training days a year. The congregations were then tasked to plant and look after the trees, including watering, protecting, and spraying them as needed. Encouraging congregations and church institutions to take part in the project was the job of the national environmental church organizations, including the Eco-Congregation Movement, Ararát, and Naphimnusz. The project has had much impact: in 2017, the project reported 259 applications, 165 established gardens, and 6002 planted saplings. 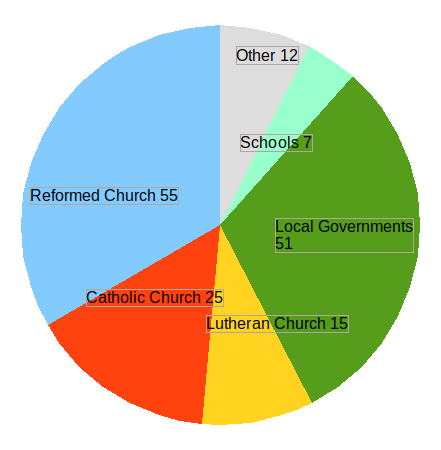 Currently, over 80 churches are continuing the mission of the project. Besides the winner project, two other projects have been recognized by ECEN with certificates, namely the Islington Sustainable Church Building Project from England and the Cowal Church Energy Project from Scotland. The official ceremony and presentation of the award have been at the ECEN Assembly in Katowice, Poland on 8 October 2018. At the ECEN Assembly, Rev. Tamás Kodácsy, Head of the RCH Eco- Congregation Program has also been re-elected as moderator of the Working Group on Eco-Theology.